The congregation worshipping at the church can trace its history back to 1867, when a school was built at which services would be held on Sundays. A temporary iron church was built next to the school in 1878, and both buildings were replaced by the current church in 1893. The church was established as its own parish in 1919. The church is basilican in layout, with a red brick exterior. The interior gives several hints to the Anglo-Catholic style of the church: a crucifix is behind the pulpit, a large icon of the Archangel Michael is situated on one of the walls, and there are even Stations of the Cross on the walls. The windows are stained glass, depicting saints, many dedicated to the memories of deceased parishioners. A large font stands at the back of the church. The service was conducted by a female vicar, who wore green vestments. I found that she spoke rather quickly during parts of the service, making some of what she said a little difficult to understand. According to the church website and service sheet, the church is currently in an “interregnum” between vicars, with the lady who took the service standing in until a new one is appointed. There was also a choir, which was dressed in white and red vestments and sat up in the sanctuary. One member of the choir gave the gospel reading, whereas the epistle reading was given by a lady from the congregation. The congregation numbered roughly 40 – I forgot to make an accurate count. The majority were over fifty, but there were several younger people as well. There was a roughly even balance between men and women. I attended the 10 am Sung Mass. This followed an order of service named St Anne’s Mass, written by James MacMillan. The service began with the vicar and choir processing around the church with incense while an opening hymn was sung. After prayers of confession came the Gloria, followed by the epistle reading, Hebrews 7:23-28. This was followed by the choir singing Psalm 34. After this came the gospel reading, Mark 10:46-52, which was read from the centre aisle after an acclamation by the choir. The vicar then gave the sermon on the subject of the gospel reading (the healing of Bartimeus the blind beggar), which was rather concise and to the point. The sermon was followed by the congregation reciting the Nicene Creed, after which prayers were said. An offering was then taken, during which a hymn was sung. This was followed by prayers (including the Lord’s Prayer) before communion, during which nearly all of the congregation went up to the sanctuary to receive communion. In a manner similar to Roman Catholic communion, the bread and wine was lifted up and an altar bell rang at the point of consecration. After communion, some prayers were said, and after a final hymn and blessing the service ended. The service was Anglo-Catholic in style, with processions at the start of the service and before the gospel reading, and incense used at various points. The service lasted just over an hour. After the service, a piece was played on the organ, which most of the congregation stayed to listen to. Teas and biscuits were then served in a small hall adjoining the church. The church was built in 1906. 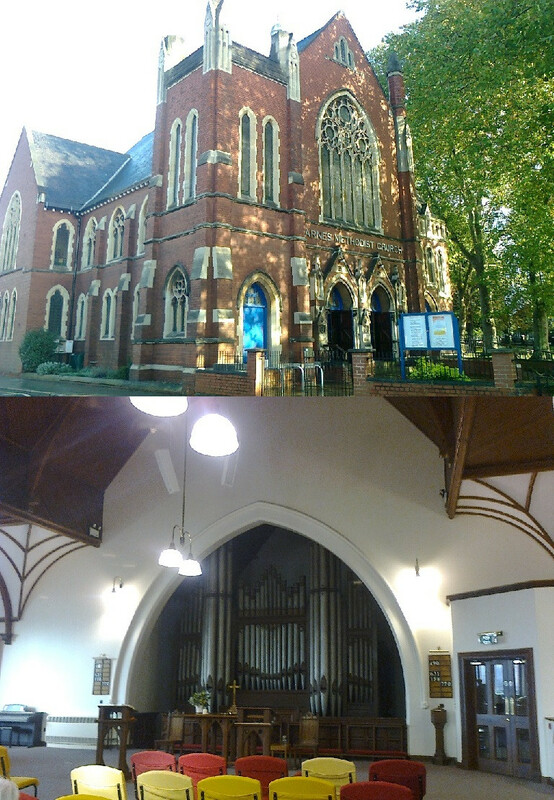 What was originally an upstairs gallery was converted into a new area for worship in 2005, with the ground floor transformed into halls and meeting rooms which are available for hire and used for community events. 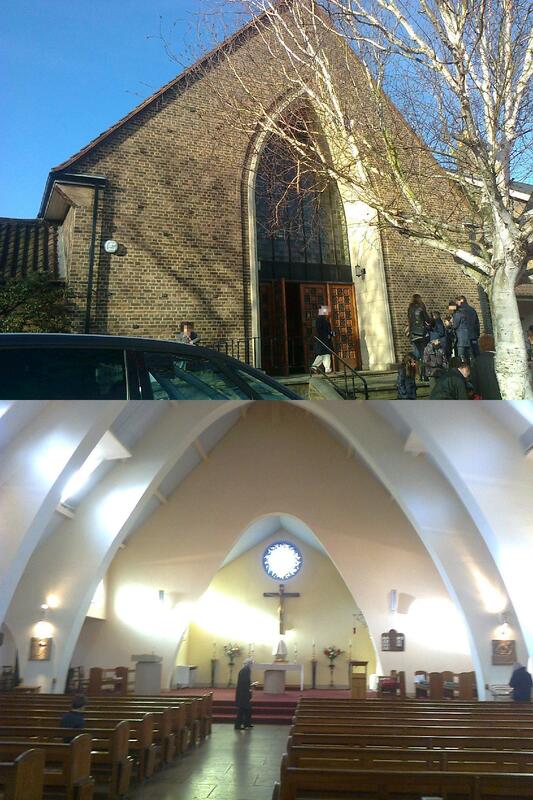 The church is, to quote their website, “a fine example of Edwardian chapel architecture”. The outside of the building is in red brick, and the upper floor room (in which the service is held – see above) has plain white walls, with several memorial plaques at the back. An impressive display of organ pipes is at the front of the room, in front of which are some tables, the main one of which has a cross and a candle on, and a simple lectern. In the front right corner of the room is a small font, and in the front left corner a piano. A crèche area is to the right of the area in which the congregation is seated, and behind them some tables with chairs around them for when refreshments are served after the service. The room was brightly lit, with sunlight streaming through the windows, which had simple stained-glass patterns on them. Although the church has a minister, according to its website she was away on maternity leave. Although another minister had been appointed to fill in for some of the services, the service which I visited was led by two female laypersons, referred to as worship leaders. The congregation numbered just under 30, a significant number of whom were elderly, but also including a few who were probably in their 30s and younger, and five young children who were in the crèche. There were slightly more females than males, and I can only recall seeing one person of an ethnic minority. I spoke to several members of the congregation during (see below) and after the service, and they all seemed very friendly. The service started with one of the worship leaders giving some notices, as well as noting that the service would be rather more informal than usual – not what I was hoping to hear, as I aim to capture an accurate reflection of what the services are usually like at each church I visit. She then lit the candle on the table at the front to symbolise the presence of Christ in their worship, which I thought was a lovely touch. After prayers and a hymn (which, it must be said, many members of the congregation seemed to barely mumble) was a talk addressed to the children on the subject of God’s love – they were given large paper hearts to decorate in the crèche, and smaller paper hearts were handed out to the congregation with the suggestion they be given to loved ones. After a more rousing hymn (with actions) came prayers of confession, followed by Psalm 121. After this came the first Bible reading (2 Timothy 3:14 & 4:5) and another prayer. After this, the worship leaders asked the congregation to talk in small groups about people who had guided them in becoming or living as Christians, some of whom then shared their stories with the rest of the congregation. After another hymn and second Bible reading (Luke 18:1-8), there followed another “group discussion”, this time on interpreting the reading just heard. After this came the offering, the Lord’s Prayer, and a final hymn before the dismissal. Tea, coffee and biscuits were served at the back of the church after the service. Some fruit squash was available on request, and I also saw a few slices of cake, although wasn’t sure if this was a regular component of the post-service refreshment or if it was there in celebration of somebody’s birthday.